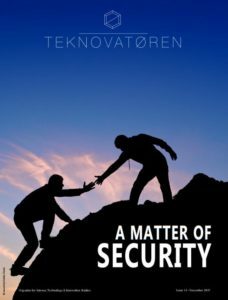 In this 14th issue of Teknovatøren, we shed light on some of the many issues of security in the digital age. We live in the most peaceful era of human history, and technological innovations – from the fire alarm to modern medicine – have contributed greatly to our safety over the past decades. However, this is not an indication that security in our time is a trivial matter. Quite the contrary. Ensuring continued safety brings new challenges as society becomes increasingly globalised and digitised. In Maslow’s hierarchy of needs, safety is the second-most basic human need, just above physiological needs. While Maslow is by no means a non-controversial figure, I don’t find it unreasonable to argue that safety is more fundamental to humans than, for example, self-actualization. Keep this in mind as you read Ana Gviniashvili’s article about the direction of the job market. After working with different aspects of security during this past semester, it has become evident that safety and security is not just a matter of protection from immediate harm. Striving for security means dealing with threats such as constrained food supply, local pollution or cyber attacks, but our sense of safety also includes assurance that the authorities treat us fairly and look after our interests as citizens – also in the distant future. As technology and human lives become increasingly intertwined, it is important to pay attention to all of these issues. Learn more about quite effective, but potentially problematic technologies in Helge Neumann’s article on biased big data, Nora Aagaard’s article on privacy-infringing smart technology, or Jørgen Tresse’s text on AI in pornopgraphy. Furthermore, our experience of different threats to our security can be somewhat biased. Terrorism is one concern that shapes public debate and is among the security concerns that we take drastic and costly measures to address. Other issues, such as antibiotic resistance or global warming, have been relevant for a long time, but the security aspects don’t seem as imminent to us and we struggle to deal with them properly. Hannah Monsrud Sandvik addresses humans’ lack of ability to imagine the most extensive consequences of our actions in her article on the atomic bomb. And finally, another reason why security is such a complex matter is that it always comes at a price. That price can be simply the annoying extra minutes needed to remember a password that is not just “Password”. It can also, however, be the price of constrained privacy due to measures of surveillance to protect society from acts of crime. As society becomes more digitised, efficiencies come at the expense of increased vulnerability. The cost of ensuring future generations the chance to grow old on this planet involves restricting the use of our common resources. These deliberations are both everyday considerations and continuous debates about how we want our sociotechnical society to evolve. At the end of the day, it comes down to which safeties we value most, and whether or not we are willing to pay the price for them. I hope you enjoy reading this issue of Teknovatøren. Be safe!